The name of the student group shall be the University of Manitoba Supply Chain Organization, also known as UMSCO. 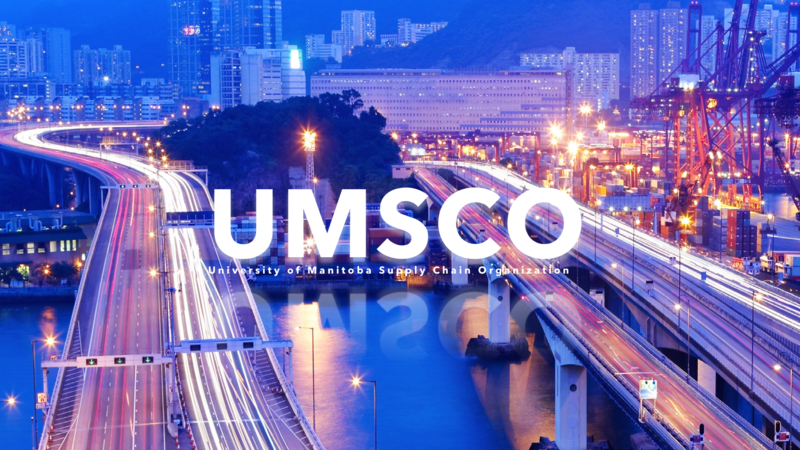 UMSCO is a student-run group operating out of the Asper School of Business. The main purpose of UMSCO is to provide information, resources and networking opportunities to students who major in Supply Chain Management and Logistics, or to those who are interested in the field. Membership is open to any undergraduate or graduate student of the University of Manitoba, so long as no less than two-thirds of the group is undergraduate students. Memberships for the group last for a full academic year, September to August. UMSCO will follow all bylaws, policies, and procedures of the University of Manitoba Students’ Union (UMSU) and the Student Group Promotion and Affairs Committee (SGPAC). All positions must be filled except for the following (in the event that no suitable applicants are available): Graduate Students Representative. The President is directly responsible for overseeing the UMSCO Council. The President works closely with internal and external stakeholders to better serve the undergraduate and graduate students. The Vice President works alongside the President to ensure the execution of UMSCOs strategic vision and success of the council as a whole. The Vice President also works closely with the Director of Corporate Relations and the CSA to secure sponsorship for the year and keep ties with the business community. The Director of Finance is responsible for ensuring the financial viability and sustainability of the council, with the primary goal being to ensure that there are ample funds to run UMSCO events and services. The Director of Finance performs the day-to-day accounting functions, manages membership and online ticketing for all UMSCO events. The Director of Corporate Relations is responsible for establishing and maintaining partnerships with the business community alongside the CSA VPCR to increase and maintain sponsorship for UMSCO events. The Director of Professional Development is responsible for the execution of professional events and activities offered by UMSCO. The Director of Professional Development leads a team alongside the Director of Academic Programming including two Event Coordinators. The Director of Academic Programming is responsible for all academic events offered by UMSCO. The Director of Academic Programming leads a team alongside the Director of Professional Development including two Event Coordinators. The Director of Marketing and Communications is responsible for the strategic development and implementation of marketing campaigns and projects on behalf of UMSCO. The Director of Marketing and Communications leads and supports a team of one or two Marketing coordinators. Work with the CSA VPM on events through email or in person to gain exposure on bi-weekly emails, all calendars, computer screens, etc. The Graduate Student Representative is responsible for communication between UMSCO and graduate students. All positions must be filled except for the following (in the event that no suitable applicants are available): Events Coordinator(s), Marketing Coordinator(s), and Executive Assistant. The Executive Assistant assists with logistics and general support for the activities of UMSCO Executive Council. They record meeting minutes, distribute them appropriately and serve as the first line of support in connecting student inquiries with the appropriate contact with UMSCO. Event Coordinators work closely with the Executive Team to plan and execute all UMSCO events. All UMSCO Executive recruitment for the upcoming year will occur no later than March 31s​t​. UMSCO will be open to nominations of candidates for all roles of the Executive. All nominated and interested candidates will be responsible to complete an application and interview process. The Incoming President and Vice President will conduct these interviews. UMSCO will abide by the Commerce Students Association (CSA) online voting guidelines as to the selection of the new President and Vice President of the organization. During the period from the end of the second week of April until the first day of May, when the new Executive will assume office, it is the responsibility of the departing Executive to orient the newly elected executive officers to their jobs. This includes teaching the incoming executive about student group and Students’ Union policies and procedures, transitioning custodianship of club records and materials (including office and mailbox keys, locker combinations and all passwords to all student group email accounts), and preparing transition reports for the new Executive to be effective in their roles for the next year’s work. It is the responsibility of the departing President to ensure that all student requirements to the Students’ Union, including submission of a complete annual report and the removal of all student group records and materials from the club office and locker, have been fulfilled before the incoming Executive assumes office. It is the responsibility of the departing President and VP Finance to bring all accounts up to date to the end of the fiscal year, and to prepare any required financial statements of the club. In addition, the outgoing President and VP Finance must arrange with the respective incoming Executive for the transition of the student group bank accounts into the incoming President’s and VP Finance’s names. These tasks are to be completed and their outputs delivered to the new Executive by no later than May 31st. It is the responsibility of the incoming Executive to assume custody of all student group records and materials and accountability for all financial activities of the student group (as outlined in Article 5) and for all club requirements to the Students’ Union commencing by no later than May 15th. The President may call an Executive meeting at any time, but must give the other Executive officers at least 48 hours notice. There shall be at least one Executive meeting per month during the academic year (September to April). The Executive will schedule at least four meetings a year for the entire UMSCO membership. Any changes (amendments) to this constitution must be approved by the current Executive Council via electronic vote and distributed posthaste to all members of the STAG. Members of the STAG shall be notified of any constitutional changes once they occur. If any member of UMSCO wishes to see the constitution, they may do so by emailing umsco.stag@gmail.com. A copy of the amended constitution must be submitted to UMSU within two weeks of the electronic vote if constitutional changes are made.